Situated on the "Green Coast" of the Atlantic ocean in the North of Portugal the independent label COSTA VERDE PRODUCTION produces and distributes worldwide high quality music for relaxation and meditation. In their own MINHO SOUND STUDIOS an experienced team creates the innovative sounds of new productions. MARGOT REISINGER, a gifted multi instrumentalist and the musical "master mind" of Costa Verde Production started the project EXISTENCE to create musical masterpieces together with world musicians from different cultures. Her motto: Differences can connect instead of separate us. Her goal: To give a musical voice to the hope for unity, peace and freedom for all mankind. Another special aim of Margot Reisinger is the promotion of young local musicians and bands. Costa Verde produced the first album of a new Portuguese rock band: "Burning Inside" by Ironic Speech in 2006. 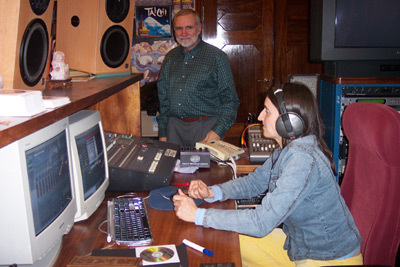 TOM BATES, international renowned and experienced American producer and sound engineer sets standards of highest quality in sound and performance of all Costa Verde Productions. Tom Bates is a musical multi talent with over 30 years of experience in sound engineering and he worked together with famous symphonic orchestras, soloists, opera singers, jazz celebrities and pop artists like Paul Simon, Bob Dylan, Stevie Wonder, Mark Knopfler and the Dire Straits, Cyndi Lauper etc. His skills were acknowledged with 8 Grammy Awards up to now and again he has gotten another nomination for the year 2007. All music productions of COSTA VERDE excel in quality and originality and are great and lasting sonic experiences. Planetary Healing - a musical voyage through the depth of our maginficent solar system. TIBET - Heart Beat Meditation - revealing the power and living spirit of Tibet. Dahmani - this album combines oriental flair with the captivating rhythms of modern Arabian music. of the Native American culture. Qi Chi Ki - a meditative journey to the Far East focusing on the secrets of vital energy and concentration. Following the journey of a spiritual traveller along Asia's different cultures and traditions of wisdom and meditation. A secret path into an ancient world of myth and harmony. INDIA - Music For Inner Balance, a meditative passage to India. REIKI - Healing Light, especially composed for Reiki treatment, creates a deep relaxing atmosphere, that provides a perfect background for any kind of healing treatment and meditation. BUDDHA and BONSAI Vol.5, revealing the power of inner silence and concentration. For both productions Margot invited the accomplished and award winning Shakuhachi player JAMES SCHLEFFER into the studio. BUDDHA and BONSAI Vol.4, a sequel to the favoured Buddha and Bonsai series and an encounter with the moving sounds of the sacred Shakuhachi flute.